When I’m given the opportunity to express my creativity, there’s no stopping me. 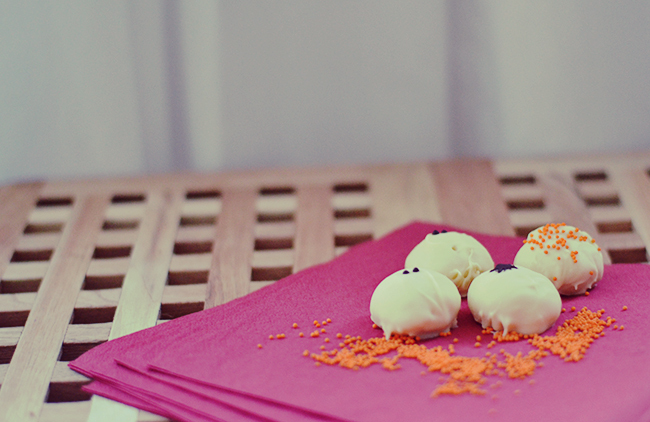 So, I couldn’t only bake white chocolate chip Halloween cookies for the upcoming Halloween party this weekend. 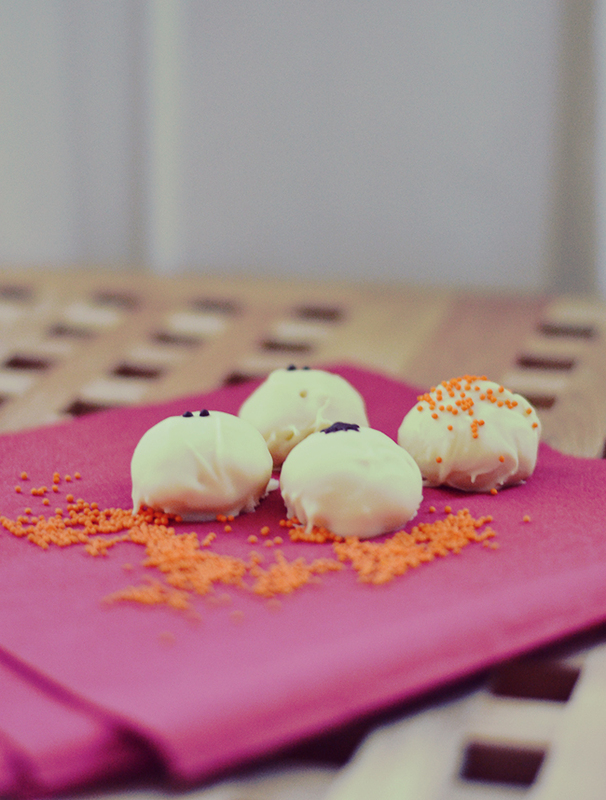 I also made white chocolate truffles, decorated to suit the event. These truffles are super simple. 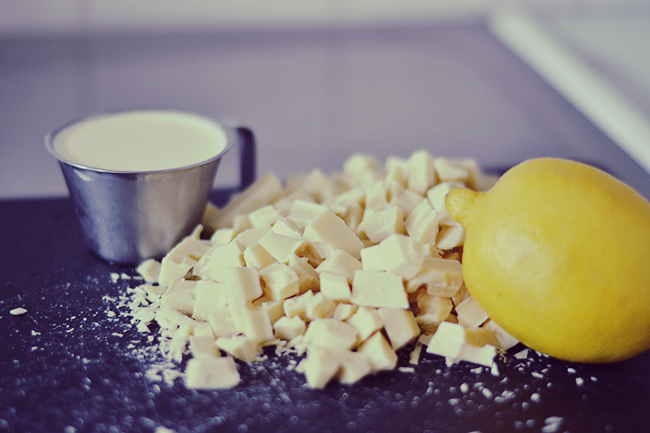 Only three ingredients – cream, white chocolate, and lemon. Heat the cream in a saucepan, then add your white chocolate and stir until it’s melted completely. Pull the saucepan off the heat and add the zest of one whole lemon (make sure you only grate the yellow part of the skin, the white part of the skin taste foul and will ruin your truffles). Pour your mixture into a small pan lined with parchment paper and refridgerate for 1-2 hours. Once chilled, scoop heaping teaspoons of the batter into your palm and carefully roll into small balls and place on a tray with parchment paper. Freeze for 1-2 hours. The next couple of steps are the tricky part, that’s when you coat the frozen truffles in white chocolate before letting them chill again. These steps need to be done fairly quickly to avoid the truffles melting, which is why I didn’t bother snapping photos of the process. Lucky for you, I’ve explained the steps in detail in the recipe below. Once coated with white chocolate and chilled again to solidify, melt dark chocolate to dot eyes and paint spiders on the truffles. Heat the cream in a saucepan on medium heat. Grate the zest of the lemon. Once your cream is warm, add 300 grams (10.5 oz) of your chopped white chocolate and stir until completely melted. 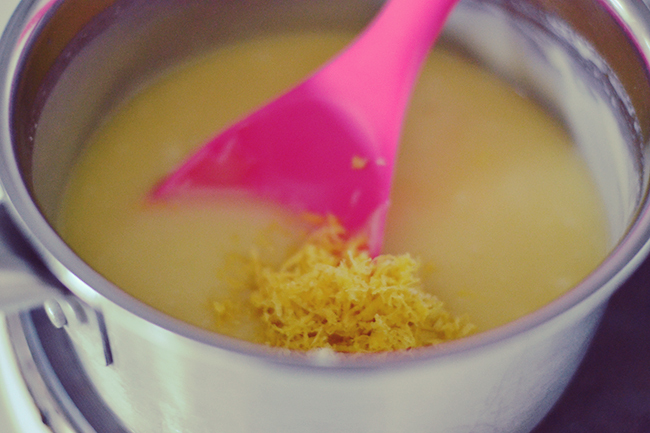 Pull your saucepan off the heat and add the lemon zest and stir until combined. Line a small baking pan with parchment paper and pour your truffle mix into it. Refrigerate for 1-2 hours until firm. Line a tray with parchment paper. Scoop heaping teaspoons of truffle into your palm and carefully roll into even balls and place on the tray. Freeze for 1-2 hours. 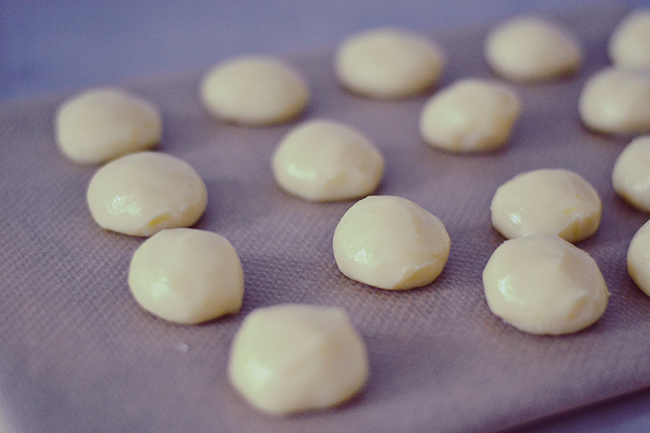 Melt the remaining 200 grams (7 oz) of white chocolate. Once melted, get your truffles out of the freezer. Using two forks, drop the truffles in the melted chocolate and roll around until coated, place back on tray. If using sprinkles or other toppings, sprinkle them over each truffle as soon as you’ve coated them in chocolate, so that the toppings stick. Once all your truffles are coated, place tray back in freezer for 15-30 minutes. Melt your dark chocolate. 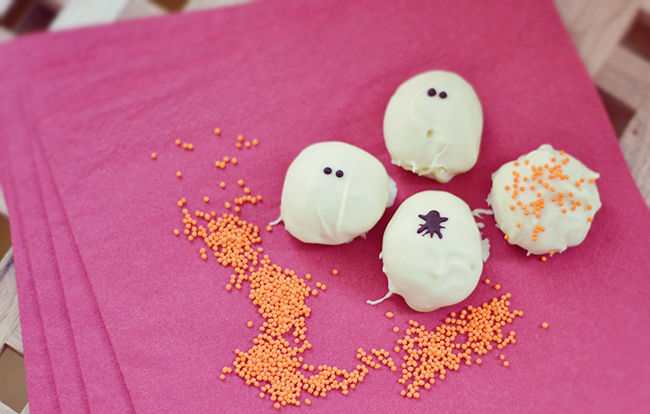 Dip a pin or toothpick into the dark chocolate and dot eyes on your coated truffles to create ghosts. Get creative, draw spiders or cobwebs using the dark chocolate.